Welcome to Commonwealth Properties Rewards! Commonwealth Properties loves to reward our return customers by offering special deals and promotions. You earn points every time you dine with us, stay with us and celebrate with us – you even earn points when you use a personal trainer or get a massage! Each dollar you spend with Commonwealth Properties earns one point. For every 250 points earned you will receive a $10 reward, which you can use towards dining, celebrating or hotel stays.You will also receive special gifts for your birthday month, your anniversary and during our surprise promotions! 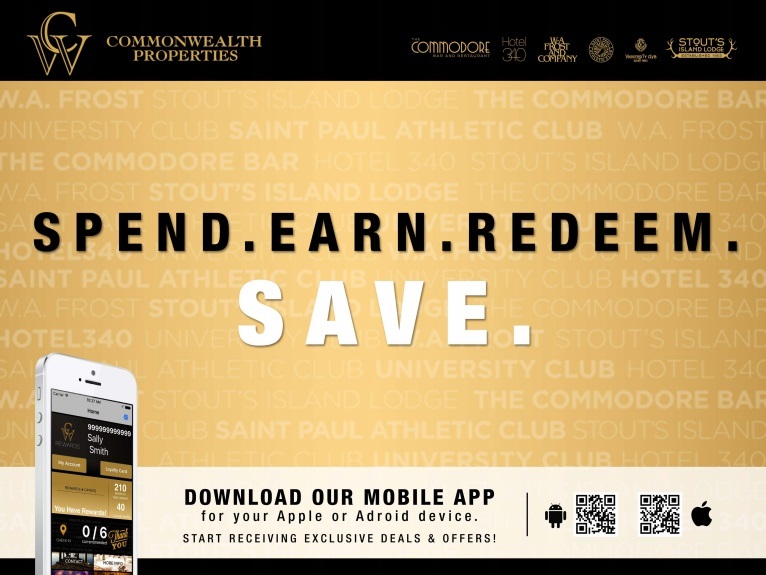 Acquire Rewards Points from any of our properties; Points are redeemable for Commonwealth credit. Receive periodic email updates about special events and promotions – many exclusively available to our Rewards Members. Birthday perks! Commonwealth Properties will help you celebrate! All Members receive an extra $10 reward plus double Points. At the beginning of your birthday month you will be sent your reward, you will have the entire month to use this reward. Anniversary. Commonwealth Properties is ready to make your anniversary as memorable as possible. In addition to utilizing our award-winning restaurants and hotels, you will receive a $20 reward plus double Points – valid for entire anniversary month. Be an individual over the age of 21. Register on-line, or complete our application, by providing required information, including valid email address.